We are excited to start our seventh CSA season and provide you with fresh eggs, vegetables, berries, herbs, flowers and plants. 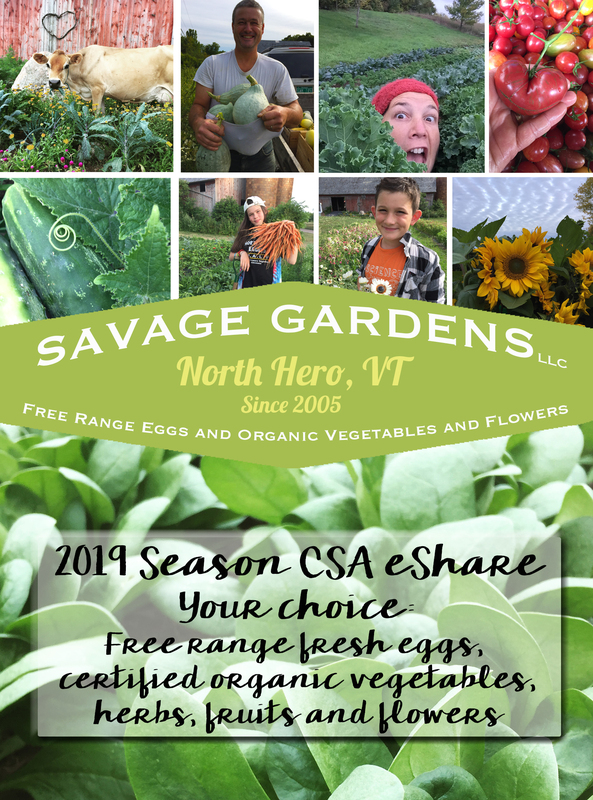 Our e-share is a pre-buy program that enables us to gear up for the growing season. 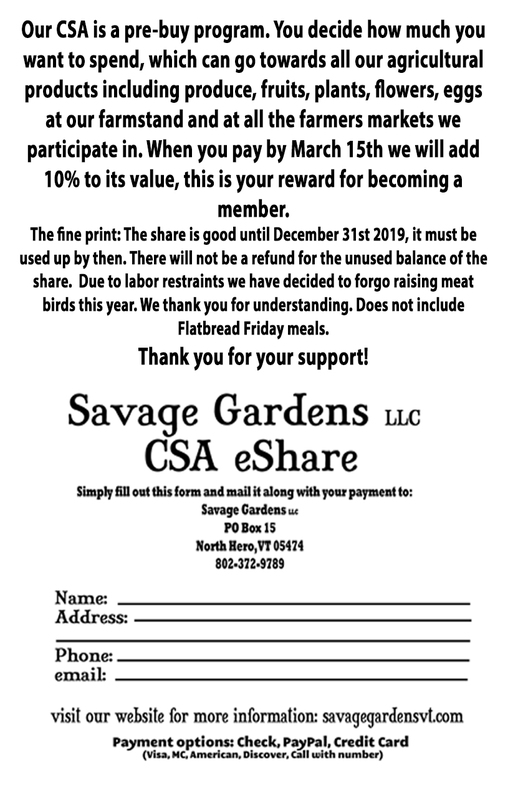 You can purchase a share for amounts from $100.00 to $500.00, in $100.00 increments and we give you a 10% bonus, when the share is purchased before March 15th, 2019. 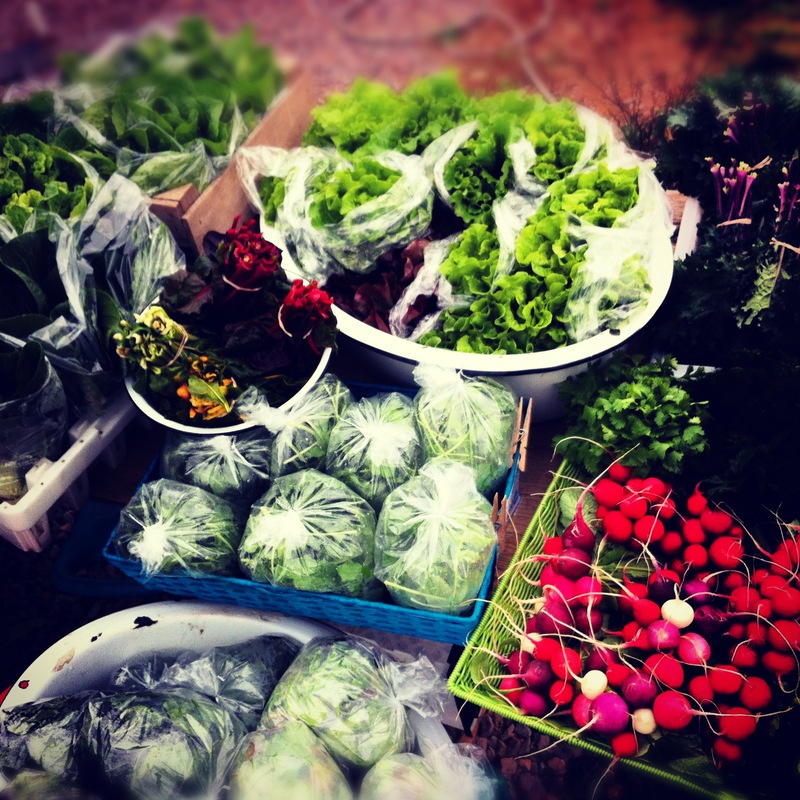 The share allows you to purchase everything we bring to the farmers markets and at our farm stand. 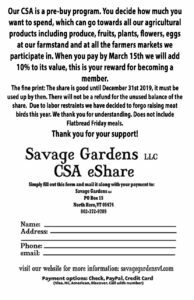 You can decide what you want to purchase for the week, if you are having a dinner party and need more food you can with this share. If you are going away for a few weeks, no worries about missing a pick-up. The share is good until December 31st 2019, it must be used up by then or there will not be a refund for the unused balance of the share. 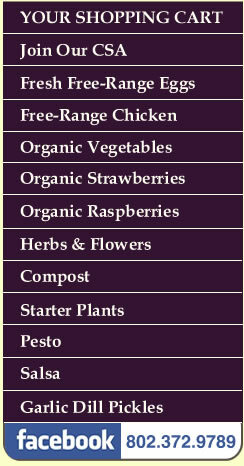 Our farm produces fresh eggs and certified organic vegetables and berries and flowers. You can have it all and get a great deal on delicious food grown in the Islands just for you. Wednesday from 3:00-6:00 behind the Saint Rose of Lima. Late May to late September. Saturday from 10-2 at Saint Josephs church in Grand Isle. Late May to Early October. located at 303 Savage Point road in North Hero, open seven days a week from sunrise to sunset, year round.